Prat Sura is the name of the small river passing by the bottom of his slopes. 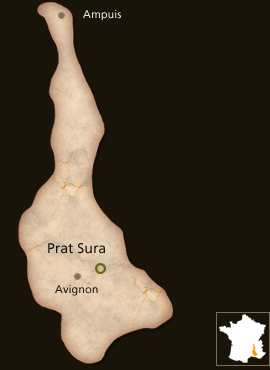 it is from the provencal language (Occitan) “Prat Sourias” the plateau of garrigues got the same name. 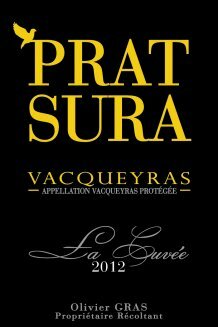 It is a very dry area..
Prat Sura is a kind of single vineyard, but could commenly be a “climat” as it is called in Burgundy. This bottling is a single vineyard type. Olivier Gras took over a part of the family vineyard (6ha) from his father. His father didn’t bottle at all. He sold all his wine in bulk. Olivier was just baccalaureate graduate when he took over. Olivier wanted and wants to produce his own wine and so selling under his own property label. It is how Prat Sura came out. Olivier started technically in 2010 but first by selling all grapes (short term cash flow). Then in 2011 he kept only 16Hl, 10% of the production (100cs) for his own bottling. He sold the rest (grapes) at harvest. Now in 2012 he started to plan to keep all grapes for his own bottling. The entire production is about 1 000cs.